Over the last several days, many readers have asked for my take on the economic crisis. I’m not an economist – my opinion is just that of an average person who has read a number of economics books and talked to a lot of people from all walks of life. Here’s my humble take on the situation. I am certain that my fellow Americans expect that on my induction into the Presidency I will address them with a candor and a decision which the present situation of our Nation impels. This is preeminently the time to speak the truth, the whole truth, frankly and boldly. Nor need we shrink from honestly facing conditions in our country today. This great Nation will endure as it has endured, will revive and will prosper. So, first of all, let me assert my firm belief that the only thing we have to fear is fear itself — nameless, unreasoning, unjustified terror which paralyzes needed efforts to convert retreat into advance. In every dark hour of our national life a leadership of frankness and vigor has met with that understanding and support of the people themselves which is essential to victory. I am convinced that you will again give that support to leadership in these critical days. Over the last two weeks, I’ve read countless articles and heard countless podcasts talking about financial apocalypse, spreading fear around like mayonnaise on a turkey sandwich. Most of the suggestions are maddening – I’ve heard previously rational people talking about pulling all of their money out of FDIC-insured bank accounts and putting them under their mattresses. All of this is based on fear, not fact. Over the last few months, several financial institutions have failed, but in each case, the resources of those institutions were immediately absorbed by other companies or, in a few cases, by governmental buyouts. No one has lost a dime in a bank account. No one has lost a single cent of insurance coverage. Many large banks – like Bank of America – have already taken their losses from the subprime mortgages and rolled right through them, and they’re strong enough that they see this as a buying opportunity. We all know the general storyline by now – these failures were the result of investing too much in bad mortgages. The truth is that no one knows how serious the actual problem is. No one. The ludicrous plan that Paulson proposed last week served one purpose alone – it gave him tons of cash to make sure that the banks run by his cronies wouldn’t outright fail. The truth is that he doesn’t know how bad it actually is. Neither does Bernanke. Neither do you, and neither do I. The panicked talk, the whispered statements about apocalypse – they’re fear. Nothing more, nothing less. I don’t claim to know what the “best” plan for resolving the situation is. My level of information about the true nature of the economic situation is extremely limited – and so is yours. I’ll tell you what I do see, though. I look out my window here in Iowa and I see the ongoing harvest of one of the largest soybean and corn crops ever – not the cropless Dust Bowl of the 1930s. I don’t see a single person with a bank account that has lost their deposits, like my grandfather’s family did circa 1932. I see people going to work, working hard and producing value for their wage, coming home, and buying the things that they need to keep their family going, which puts money directly into the economy. 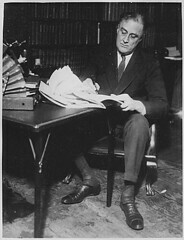 I see unemployment barely over six percent, not the 25% rate at the time of FDR’s address. I see industrial production still rising – in 1932, it had fallen by more than half in just three years. I see a dollar that’s actually strengthening, not weakening, while the price of oil is down sharply from its highs earlier this year. In short, I see a lot of things that make me optimistic about our ecnomic situation, a pretty stark contrast from the fear being peddled by some. I’m actually much more reminded of 1987, when banks were failing thanks to the Savings and Loan crisis and Black Monday, when the Dow dropped 22% of its value in a single day. We haven’t yet seen anything as worrisome as that, in my opinion – and that was just a drop in the bucket compared to the 1930s. To put it simply, I’m still not worried a bit, and when I see the fear being bandied about, I’m reminded of FDR’s words. So what have I been doing with my money as of late? I haven’t seen any FDIC-insured bank account fail, and none have in the history of the FDIC. Almost all of that money went into broad based index funds – namely, Vanguard’s Target Retirement 2045 fund. I’m still following my own game plan. If you make any irrational moves, like pulling all of your money out of stocks, does someone profit from it? Of course they do. Your brokerage will make a fee from the sale, and a happy buyer out there will be glad to buy that stock from you at a nice discount. Fear is the best salesman, after all. Sit back and get informed – and don’t just rely on one source for information, either. Get a bunch of different angles on what’s happening, from liberals and conservatives and moderates alike. If you’re worried about your money, do your own research and find out reasonable things to do with it. Take a serious look at what people who really know what they’re doing are doing with their money – in the last two weeks, Warren Buffett has invested $3 billion in General Electric stock and $5 billion in Goldman Sachs stock (an investment bank … weren’t we supposed to be afraid of those?) – he sees this current situation as an opportunity to buy, not sell. And one more thing. Even in the darkest heart of the Great Depression, 75% of Americans had a steady job with a steady paycheck, which they steadily used to buy the things they needed. Those years also produced the Greatest Generation and an economic steamroller that ran through the last half of the Twentieth Century like a tidal wave. It was true 75 years ago. It’s true now.